Big Sur's coastline is marked by wave-sculpted blowholes and sea stacks populated by Brandt's cormorants, black oystercatchers, and other birds. Year-round sightings of California Condors can be had as well due to an ongoing reintroduction effort. Scores of shorebirds feed on the beaches. In the spring and summer, endangered Smith's blue butterflies inhabit buckwheat on the coastal bluffs. From parking overlooks, watch nearshore waters for wintering loons and scoters and resident harbor seals, California sea lions, and southern sea otters. Northern elephant seals and California gray whales will be farther out. Several coast overlooks are bordered by the 165,000-acre Ventana Wilderness, where wildlife is abundant, including marbled murrelets, spotted owls, and endangered birds of prey. Background: The Ventana Wildlife Society's Discovery Center is located in Andrew Molera State Park, a gateway to wildlife viewing in Big Sur, California. 300+ wildlife species. 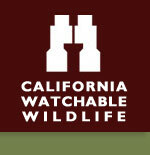 The Habitat: Coastal Redwoods, Oak Woodland, Mixed Pine, Beaches and Maritime Chaparral. Topography of the Ventana Wilderness is characterized by steep-sided, sharp-crested ridges separating V-shaped youthful valleys. Most streams fall rapidly through narrow, vertical-walled canyons flowing on bedrock or a veneer of boulders. Waterfalls, deep pools and thermal springs are found along major streams. Elevations range from 600 feet, where the Big Sur River leaves the Wilderness, to about 5,750 feet at the Wilderness boundary circumventing Junipero Serra Peak. Marked vegetation changes occur within the Wilderness. The Experience: Many people from around the world come to Big Sur to see the endangered California Condor, which arguably is the best place on earth to find these rare birds. Seeing a condor in flight with its' 10-foot wings is truly awe inspiring. Wildlife and Where to Find It: Start and/or plan your visit to Big Sur at the Ventana Wildlife Society's Discovery Center. If interested in a condor tour but is not available, you can go to Mile Marker 37 which is one mile north of Julia Pfeiffer Burns State Park. This is a good place to look for condors soaring along the ridge or beach. Be sure and check out the waterfall on the ocean side of the highway. Viewing Tips: More than 200 bird species. Marine birds, shorebirds, and brown pelicans are seen year-round; best viewing in winter. Look for waterfowl in winter. Moderate probability of seeing birds of prey, marine mammals, deer, and small mammals year-round; peregrine falcons is spring and summer. High probability of seeing songbirds in spring and summer. Watch for gray whales from December to April. Marbled murrelets and spotted owls nest in the redwoods. Enter Ventana Wilderness at Big Sur Station. Site Notes: Many other trails above the Big Sure are great for backpacking experience. Because of Big Sur River, best riparian habitat on the Central Coast and therefore a major stopover for migrating songbirds. Vagrants come through that are found out of their normal range. One of Audubon Society's IBA (Important Bird Area). Road Hazards: ROAD CLOSURES: Winter storm damage to Highway One has made it difficult to access the few open trail heads in the Ventana region. Parking Notes: Limited parking at Discovery Center and paid parking within and more availability at Andrew Molera State Park. How to Get There: Drive 26 miles south of Carmel on Highway One to Andrew Molera State Park. This the first park coming into Big Sur Village area -- the gateway to the area.